Our World Furniture for Equal Dignity idea is part of our quest to build bridges from social science to other areas of life. When we look around today, we all fill our houses with more or less the same furniture, Western furniture. We, the HumanDHS group, believe that cultural diversity should receive more respect and attention, which, in the case of furniture, means that the diverse cultural heritage in furniture that we find around the world should be valued more and made more visible in day-to-day wear. We wish to integrate the world's heritage into future-orientated innovative and creative design for day-to-day use. Evelin Lindner has developed ideas for furniture that draw upon the traditions from several cultures. Particularly her office furniture combines information technology with the message of human dignity. An important point for HumanDHS is to deconstruct tradition, in this case traditional furniture design. We do not wish to accept everything as it is. Many aspects do not bolster our aim - equal dignity for all. Chinese footbinding is a drastic example of how women were intentionally mutilated and handicapped in order to fit into an image of feminity as cuteness and helplessness. We do not wish to preserve those aspects of tradition. 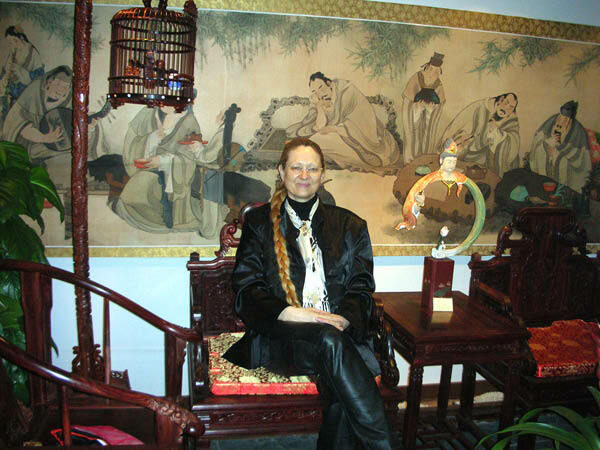 Many pieces of furniture, both traditional and modern, carry "footbinding" aspects. Beauty and elegance are often conceptualized in ways of méconnaissance and naturalization (Barthes, Bourdieu, Foucault). We wish to encourage people around the world to opt for new definitions of beauty and elegance, definitions that avoid "footbinding." Evelin Lindner wrote in her book Making Enemies the following: "A good Egyptian friend filled his Western "container" home with pitiful imitations of Western furniture, Louis XVI styles. He and his family were accustomed to squatting, but he packed the new house with chairs and fauteuils that nobody ever sat on. The only purpose of this furniture was to cater to and impress the Western guest. The new house had a modern kitchen, but no courtyard, where his Egyptian family used to cook their communal meals. The family had no alternative but to huddle in the small, windowless corridor on their carpets to recapture some of the life they were used to living, misplaced in their fine new house. To witness this "voluntary self-humiliation" literally broke my heart. (Incidentally, squatting is a very beneficial exercise, from the anatomical point of view. In recent years gynecologists have admitted that giving birth in bed is convenient for the attending doctor, but not the best position for the woman. Defecating and giving birth are both aided by squatting, as is the overall flexibility of the body. Chairs are not made to promote human health. They produce stiff people with back problems. In this respect, also Western "civilization" does a disservice to itself in a self-humiliating way, without being aware of it. Chairs are like thrones, they give status, the chairperson , after all, leads the meeting. However, as soon as everybody is sitting on chairs, we are left with nothing but back pain.)" Clearly, future-oriented design entails more than just design. It means also awareness for fair trade, respect for the people who produce products, in this case furniture, and more personalized relationships between products and users. We look for interested people, who would like to develop our WFurED page. Please see our Call for Creativity. Yesterday, in the afternoon, I went to the Shanghai Grand Theatre to buy a ticket for the evening performance of Chinese Acrobats. Just opposite the ticket office, I found a wonderful tea house with excellent classical Chinese furniture. The name of this tea house is Ming Ya Tang. 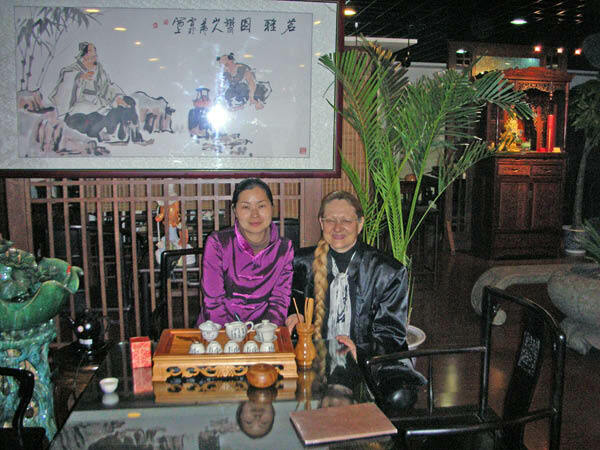 I enjoyed a wonderful tea ceremony with Wang Su Qin. Since 1983, I have forgotten most of my Chinese and can no longer really communicate in Chinese. I would have liked to talk more with Wang Su Qin. However, through body language, we enjoyed each others' company a lot. She showed me two impressive books on "New Orientalism" published by Liao Ning Science and Technology Press in Shen Yang, in the North of China (www.shenghui-cn.com, or www.lnkj.com.cn). I also met the manager or owner of the tea house, Ding Xiao Dong, who is connected to a factory that produces classical Chinese furniture, Kai Feng Li Classical Furniture, located in Fu Jian in South China. Shanghai, April 2006. Ming Ya Tang Tea House in the Shanghai Grand Theatre building. 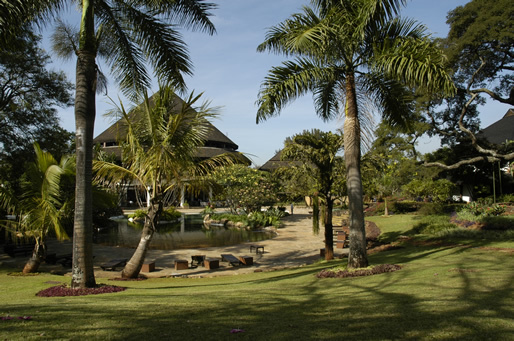 Safari Park Hotel in Nairobi combines African style elements in the most gracious manner. What a style! So much beauty! I wish more of African architects and designers would follow this example! And it would be great if other parts of the world would use their heritage in similar ways! Please see also African Heritage Architecture.